Asia-Uzbekistan-Karakalpakstan-Nukus Karakalpakstan is in the west of Uzbekistan. It even has its own flag and language. 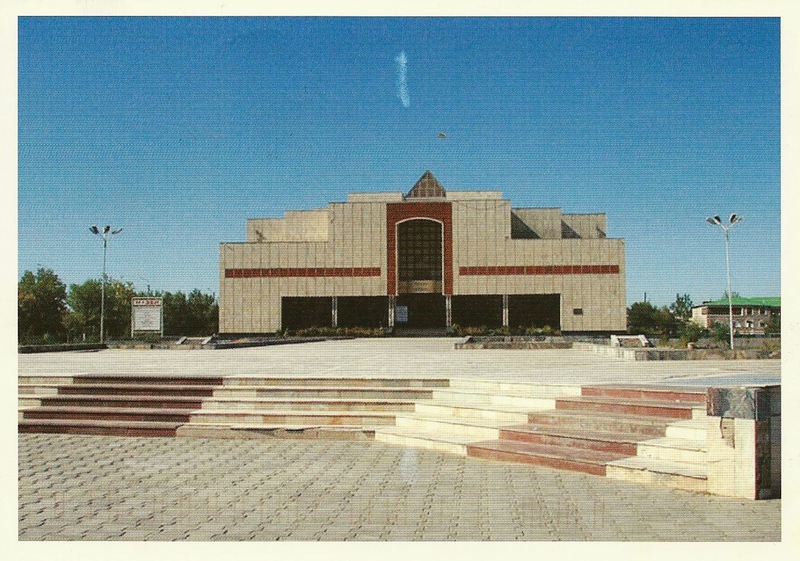 The main tourist attraction here is the Karakalpakstan State Museum of Art. 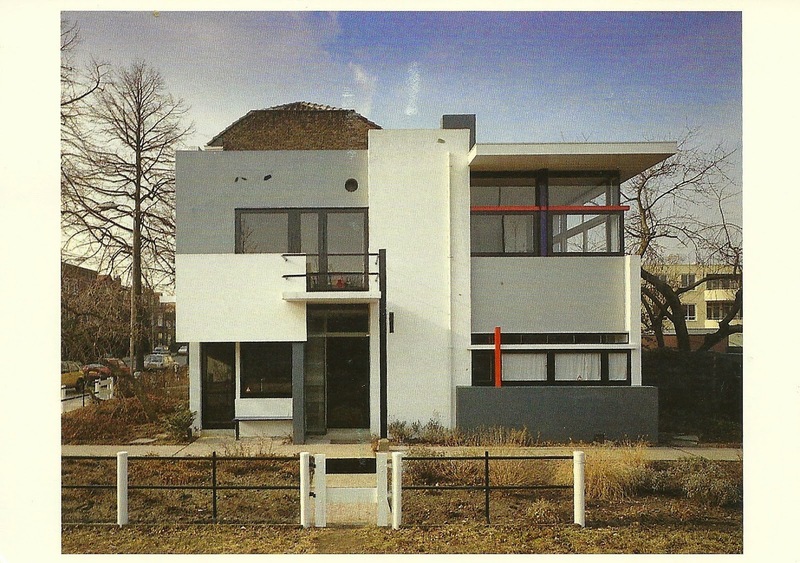 It houses the Savitsky Collection. This is the second largest collection of Soviet avant garde paintings . I guess because the museum was in the wilderness and away from Moscow it was left alone. These type of paintings were banned from display in Soviet times. A fascinating Gallery . Mailed this at a friendly post office in Nukus. 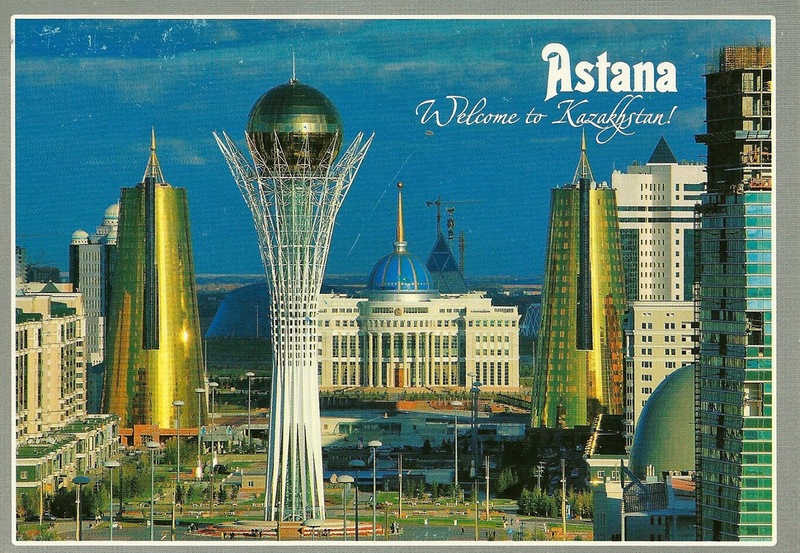 Asia-Kazakhstan-Astana Astana is the capital of Kazakhstan. The commercial capital is Almaty. As you can see it is very modern and in effect a new city. I was here to see Kazakhstan V Ireland in Football. Astana is not very charming as it looks like it just came of a computer drawing. However saying that some of the buildings are pretty amazing. In this part of Kazakhstan Russian language is used more than the local language. Outside Astana spend a interesting day visiting a Gulag from the old soviet days which is now a museum. I had a lot of fun the the main post office in Astana trying to purchase interesting stamps. I had gone into the building without any guide. In the first place trying to find out where to purchase stamps was difficult. 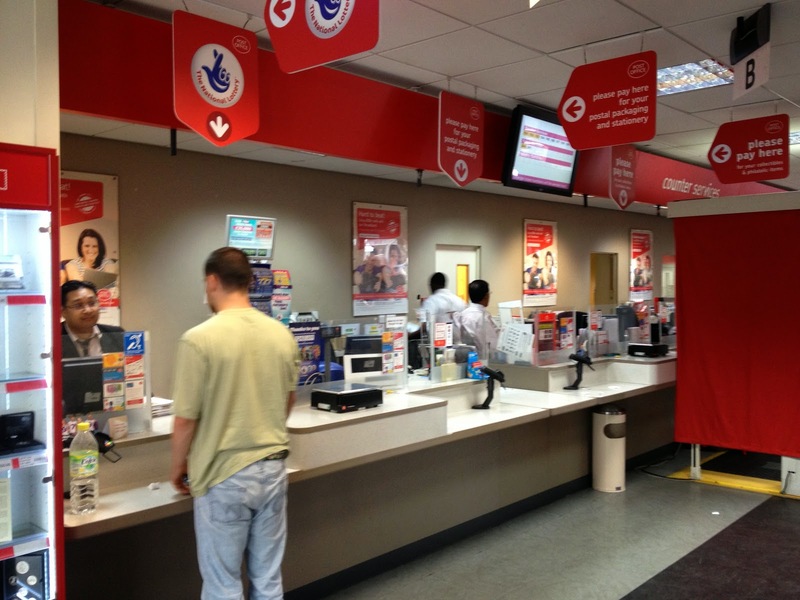 The post office is modern and very busy. But the stamp counter consisted of a lady in a doorway sitting at a table and not behind a counter like everyone else. I tried to explain that yes I did want stamps but no I did not want the plain definitive stamps on offer to me. Luckily I found someone in the Post office that understood English. I was then brought into the inner sanction of the Post office . There was one room with some stamps in a drawer. I was able to select from the latest stamps. Apparently that the Philatelic section is in Almaty and that is the place to buy the stamps. It was all fun and smiles all around , especially when I apologised for Ireland winning the football match. Asia-Uzbekistan-Bukhara What a wonderful city to visit. The old city is quite small and easy to walk around. Full of atmosphere. This Postcard is exactly how it looked. 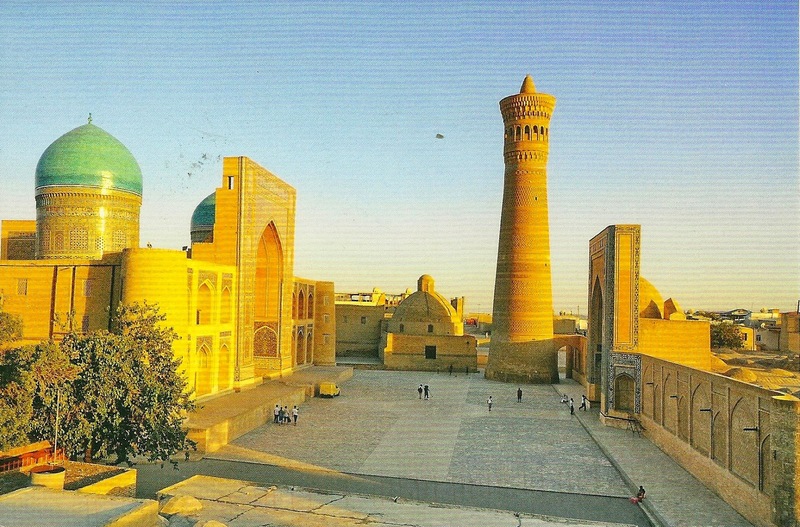 Bukhara is a World Heritage Site. This card was posted in the local Post office. This was right down town and I had to use the mail box outside as the Post office was closed. I had purchased these stamps in Tashkent. Asia-Uzbekistan-Khiva This place takes your breath away. Spend a wonderful few days here. Got here by overnight train which was so much fun. Another World Heritage Site. The Post office was a little off the main street, but was able to drop this in at the counter. 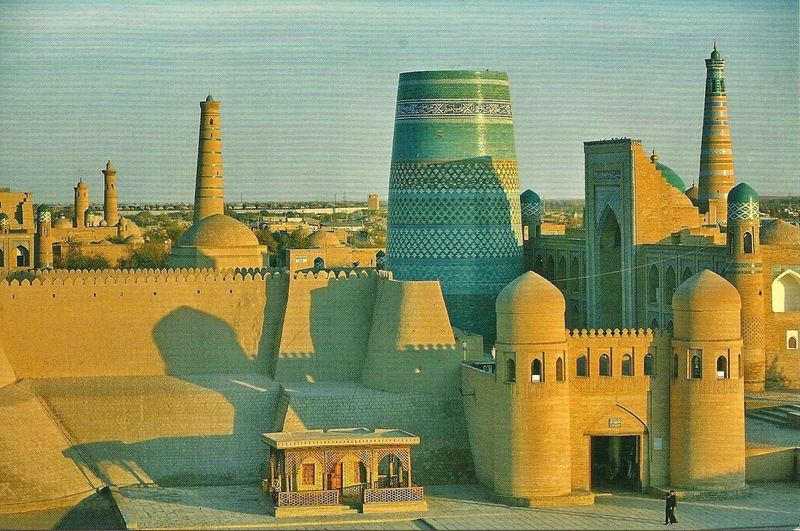 I should also have a card from Samarkand. But I had made a mistake which I never really do . While walking around I seen a sign for "Post Office" . It was very handy and near the tourist sights. I had the cards already written and also the stamps. So I just needed to hand them in . However I soon discovered that it was in fact a tourist shop even though it had Post office sign outside. I did not make a purchase in the shop and left the postcards in a basket , like many others. The cards never made it home. I should have just made sure as I usually do that they were posted at a regular Post Office. 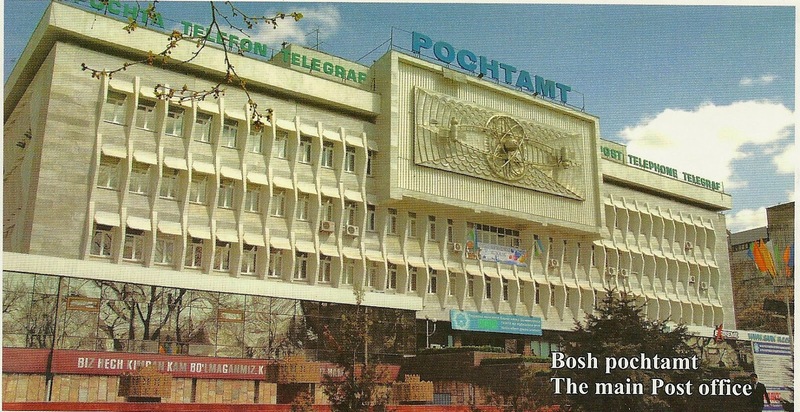 Asia-Uzbekistan-Taskhent Not often that I find a postcard of the main Post office. You can see it is of the old style large Post office type that we no longer see in Europe. I have a love of Post offices and always spend some extra time especially in the Main Post office in a capital city. The Post office in Taskhkent had many counters and was not busy. The Philatelic counter had its own shop in the main concourse. They had a full selection of stamps going as far back as independence from the USSR. So it was great to be able to browse the available selection of stamps. 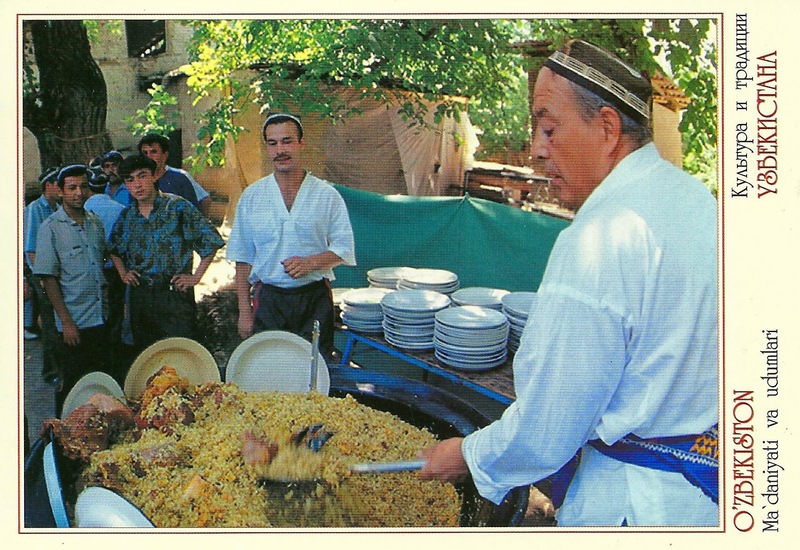 Asia-Uzbekistan-Tashkent Uzbekistan is a fantastic country to visit tourist wise. There is so much to see and was at the centre of trade when the Silk road was at its height. Cash had to be exchanged at the black market and myself and my friends all had bundles of cash to carry around to pay for meals and so on. It is not an expensive country and a must see in Asia. Here are some of the latest stamps issued the year I was in Uzbekistan in 2012. A very clear postmark. Europe-Netherlands-Amsterdam I have been planning to visit the Anne Frank house /museum. But every time I did plan to go the line was too long. However this time I made sure I planned it. I was there very early sunday morning and second in line. It was worth it. I am very interested in history and enjoyed the museum very much. Here is a postcard showing part of the famous diary. I had no luck buying different stamps while in The Netherlands. 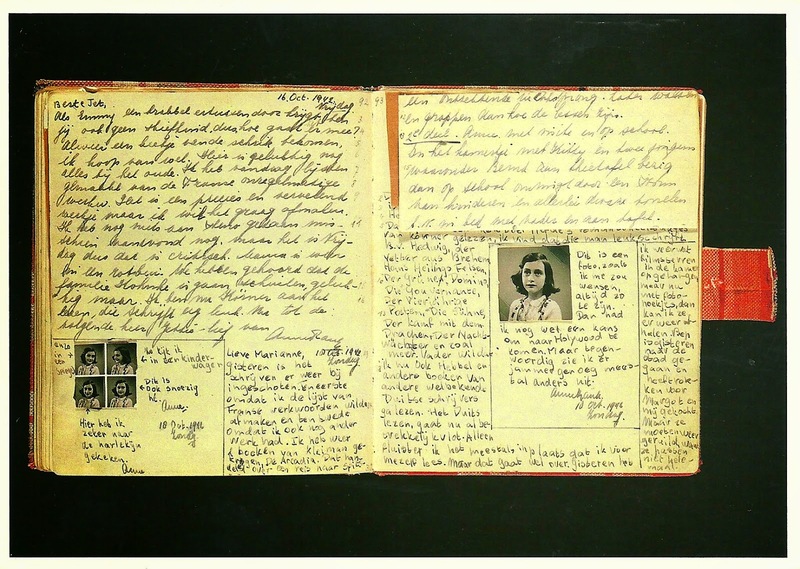 However on Sale at retail prices was a set of stamps isssued before to commemorate Anne Frank. One stamp showing inside and the other part of the diary. Europe-Netherlands-Amsterdam This card is to celebrate my visit to the Van Gogh museum. I also wanted to find out how to pronounce the name Van Gogh as I had noticed a different pronunciation in the USA as against Europe. I found out that in Dutch we both said it incorrectly . I cant pronounce it here, but you need to use the back of your throat to say Van Gogh. The museum was very interesting even though most of the works were lesser known. 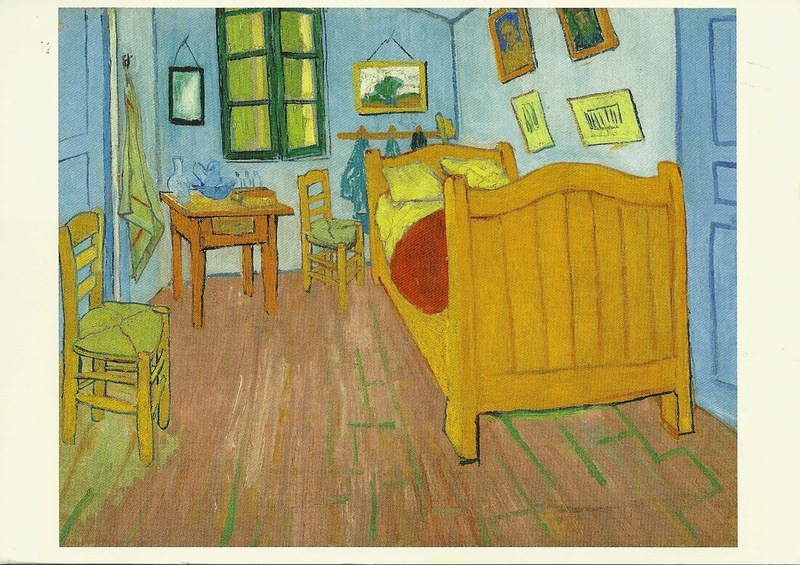 However the above Painting "The Bedroom " is well known and great to see in real life. Europe-Netherlands-Kinderdijk Here are the famous Windmills of Kinderdijk. The scenery around here is marvellous and it was interesting to see the inside of a windmill. A World Heritage Site. The coffee shop near by while waiting for the train or bus I cant remember , had a postbox..
Europe-Netherlands-Texel This was my first time to really explore more parts of the Netherlands. So great to go up North towards the Wadden sea which is a World Heritage Site. Went across on the ferry . It is quite touristy but still charming . There was a Post office here but no extra stamps to choose from . Europe-Netherlands-Amsterdam Here are images of Amsterdam which includes its Canals which are a World Heritage Site. 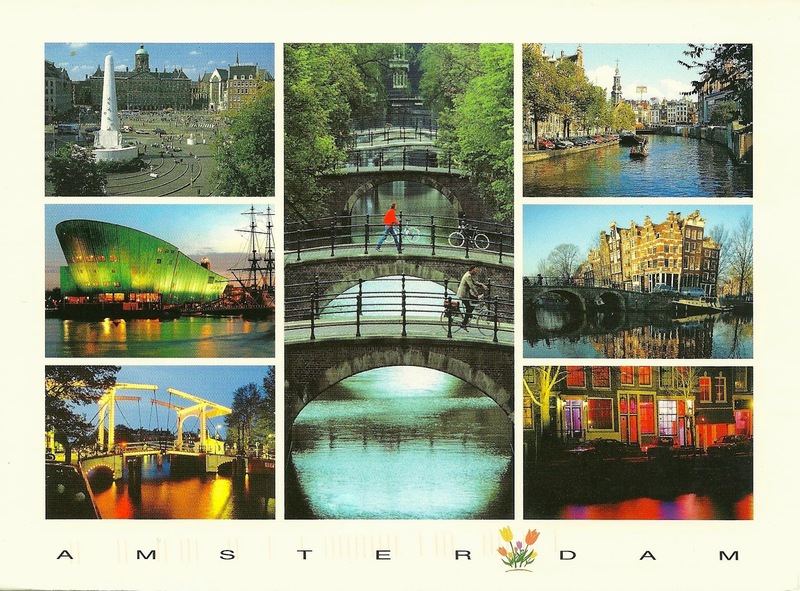 I have not been to Amsterdam for many years and enjoyed the city which is very easy to get around. 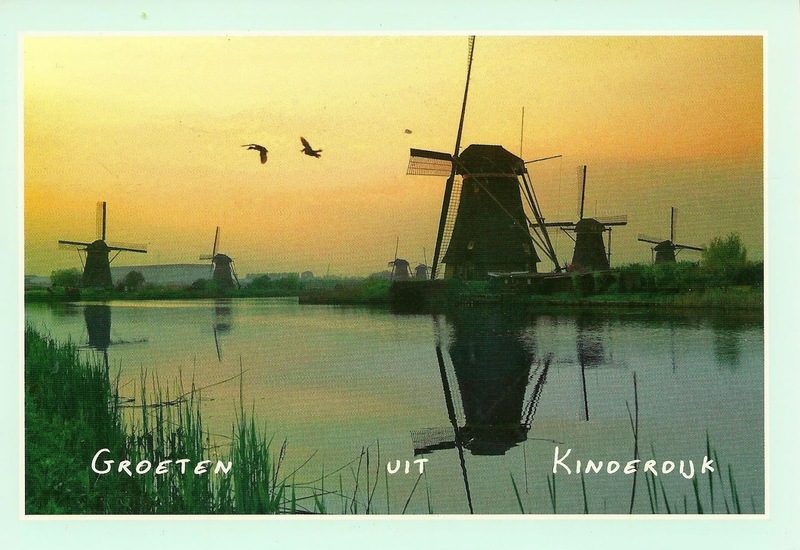 Before I visited the Netherlands, I contacted the Dutch Philatelic Service. I had heard it was difficult to get a selection of stamps and that there was in fact no Post offices as I know them. They told me on the phone that there was certain newsagents that sold a selection of stamps. Well I was very disappointed as I found this not to be the case. If I had known that I would have ordered stamps in advance. Here you can see the sort of stamp I could purchase. Europe-Netherlands-Utrecht This wonderful house is well worth the visit . It was build in 1924 and now a museum. It has some very innovative ways with walls . It is way ahead of its time for 1924. A worthy World Heritage Site. Initially this postcard came back with no Postmark. So sent it back and now got a postmark. Though hard to see if there is a city on the date stamp at all. North America-United States of America-Florida-Palm Bay Here to visit friends. A nice area and lots of water activities to take part in. Posted this in the local post office, but when I got the card it had no postmark. So I sent it back again and second time lucky . North America-United States of America-Florida-Tampa It is my first time to post a Magnet online. But this was the only way I could get a postcard on the ship also a magnet. 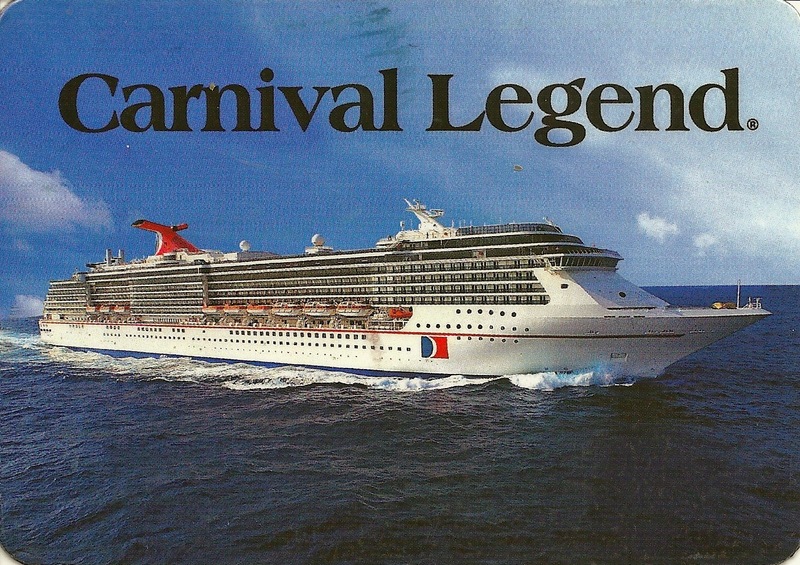 This is the Carnival Legend . Finishing up in Tampa . This card is quite heavy for the mail man, but delighted to have it. I dare say not many people actually use them as postcards. North America-United States of America-Florida-Orlando I rented a car and went from Tampa to Orlando for a few days. It is over 20 years since I had been here so interesting to see the changes . 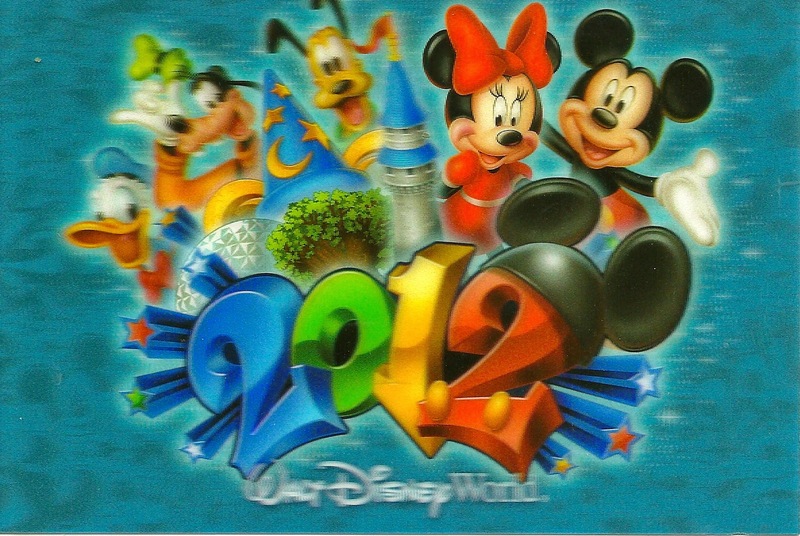 Went to Disney World , but not up to as much as I was when younger. Here is a 3 D type card . Very colourful. There is no longer a post office in Disney , just a regular mail box. Some colourful stamps with a Orlando postmark. 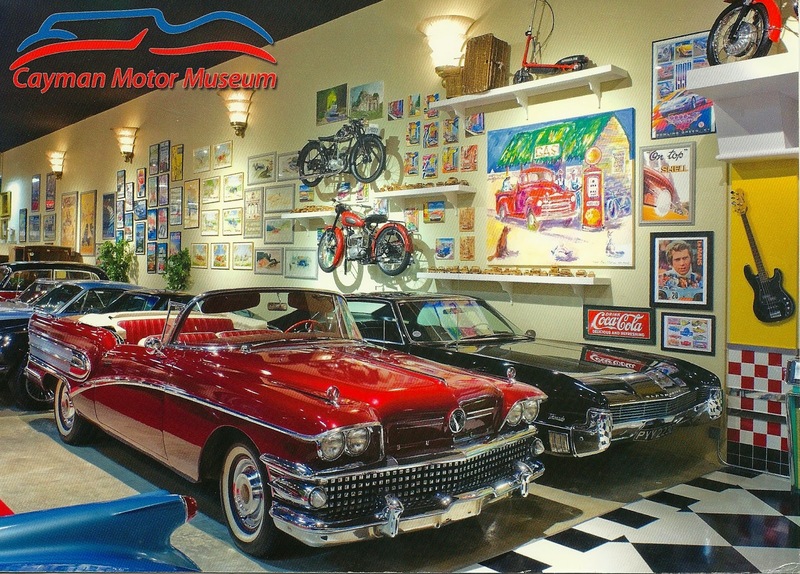 Caribbean-Cayman Islands-Grand Cayman-Hell Here is the fabulous Motor Museum in Hell. Really loved it . The cars were in tip top condition . There is a Post office here in Hell , modern with helpful staff and a selection of stamps. Caribbean-Cayman Islands-Grand Cayman-Hell This is the old Post office in Hell . Not in use any more. Worth a side trip when visiting the Motor Museum . There is also a tourist attraction where you stand near a Wooden shape of a Devil and take your photo. Fair dues to Hell for making the most of its name ! This postcard even has Hell stamped on the top. Europe -England -London Over in London for a Weekend trip. Main reason here was a meeting of Travelers Century Club UK/Ireland. Here there are few World fellow travellers so we can discuss new countries and exchange information and talk about past and upcoming trips.. Always a enjoyable day. Below you see a photo of the previous event in September 2013. 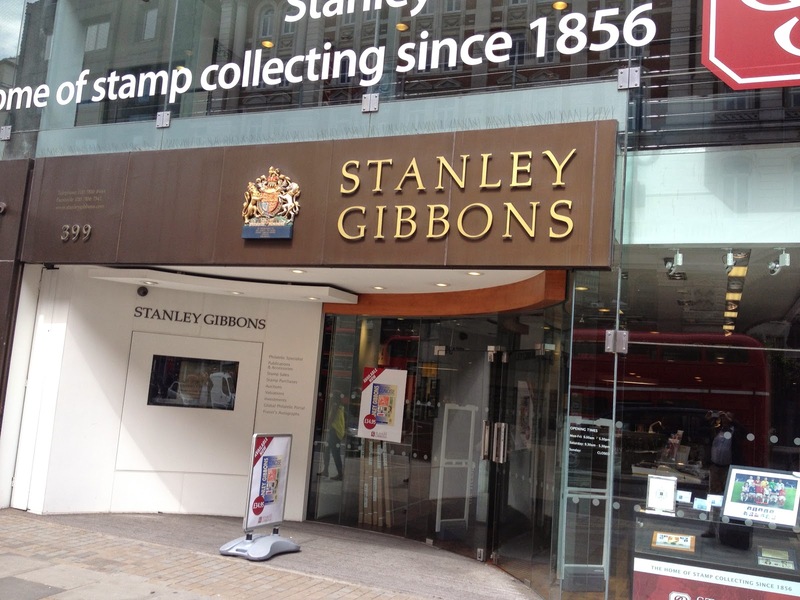 Since I was younger than I care to remember I always paid a visit to Stanley Gibbons . I have great memories of when I first visited the shop in the Strand and looking over different stamps from all the commonwealth countries. It did my geography no harm. Today I tend to sell more then I buy..
London also means a visit to the West End . 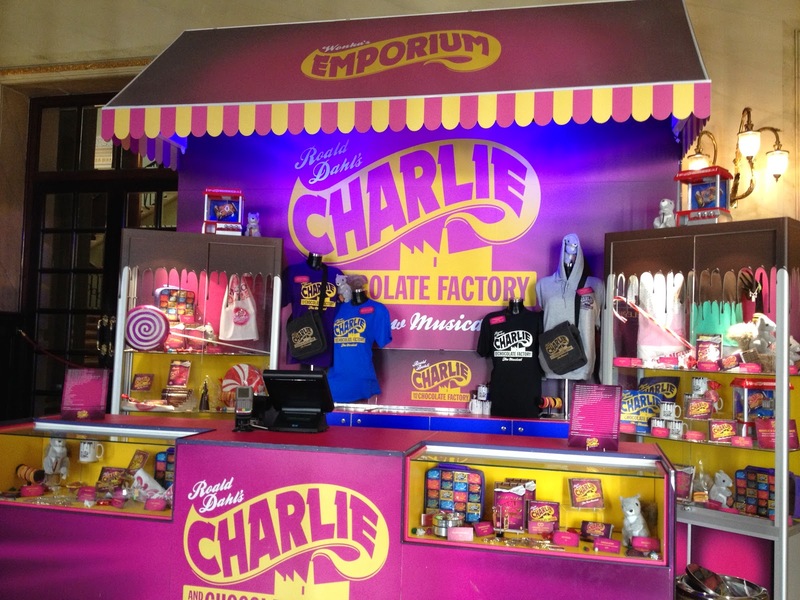 This time to see Charlie and the Chocolate factory. London is great for theatre especially musicals. Finally a trip to the Post office. The main philatelic office for the UK is in Scotland. 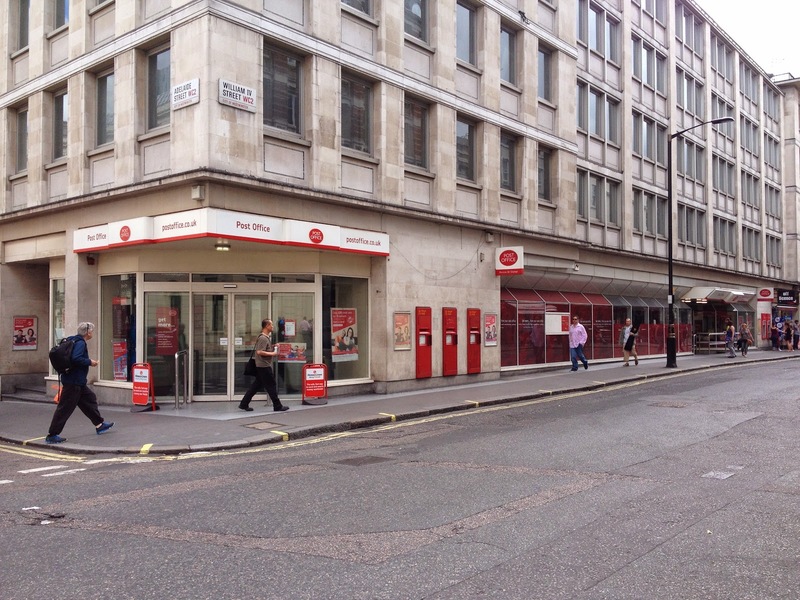 So in London this is the Post office to visit at Trafalgar square. 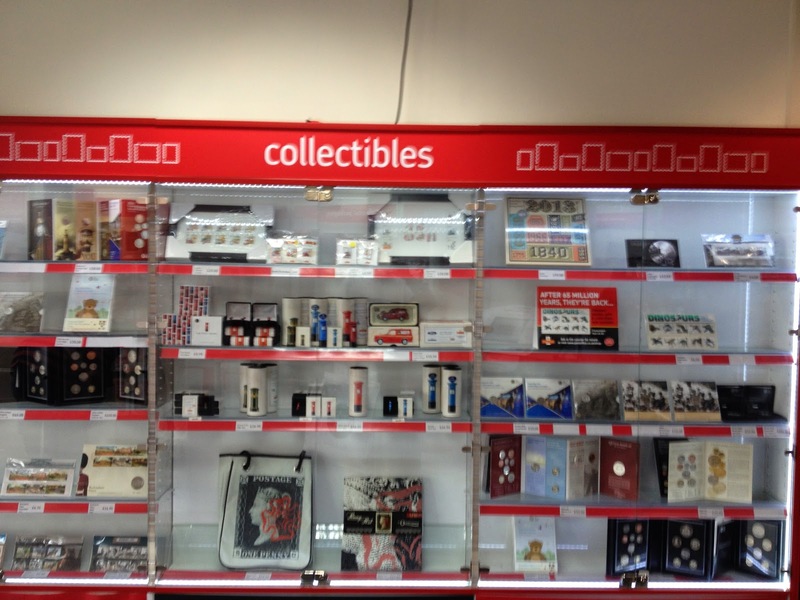 Here you see some photos of the collectibles section . The Post office used to be the full building now just one end. So my busy trip to London came to a end . On this occasion did not do the tourist sights as had done most of that , but the British Museum is always worth a look . Every time you go you see something new that you had not spotted before. 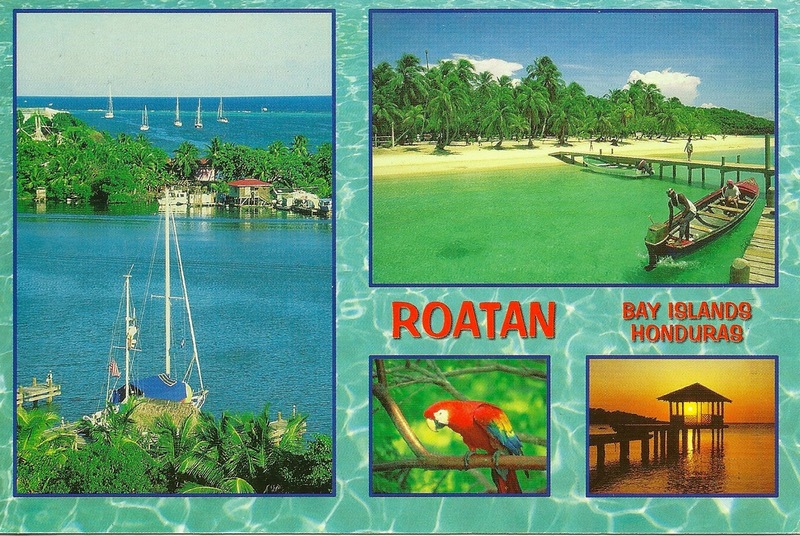 Central America-Honduras-Bay Islands-Roatan-Coxen Hole Honduras has considered to be the highest crime rate in the world per head of population. So not exactly and welcoming invitation for tourists. However here on Roatan it felt very safe.The locals were friendly and enjoyed my walk around the small town called Coxen Hole. 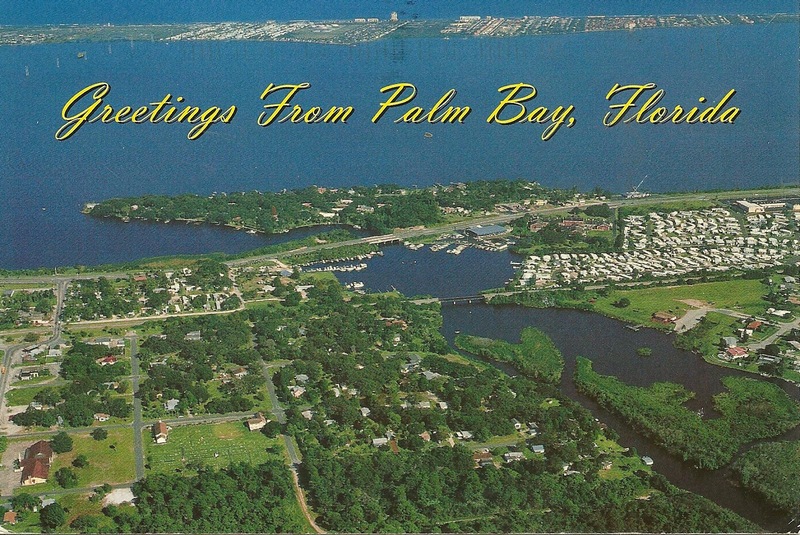 Had a wonderful lunch overlooking the bay as seen on this postcard. On getting off the ship at the wharf I did see many souvenir sellers including one selling Postcards and stamps. I did buy the postcards but not the stamps. I told him I would buy at the Post office . When I did find the very small post office it was dark and quite empty. There was a guy sitting at the desk with his feet up. No business here I though to myself. Well can I buy some stamps please. "No". The head post lady is not in today and she has the stamps. . I found out that the stamps are brought home every night just in case the post office is broken into. "Come back tomorrow" I was told. Well how often have I heard that in all the post offices I had visited. Luckily I was able to revisit the wharf and buy the stamps there. I told the guy about the lady in the Post office and was told it is more closed then open. 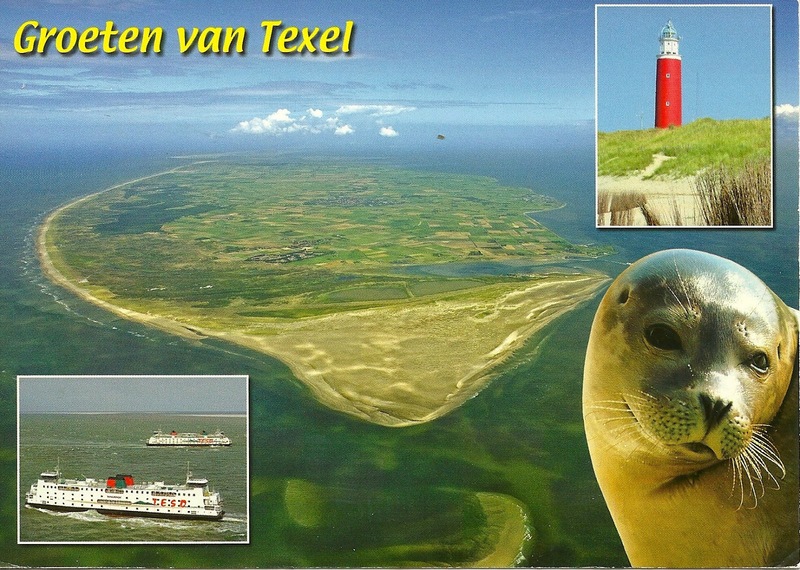 In saying that the Postcard arrived back very quickly. 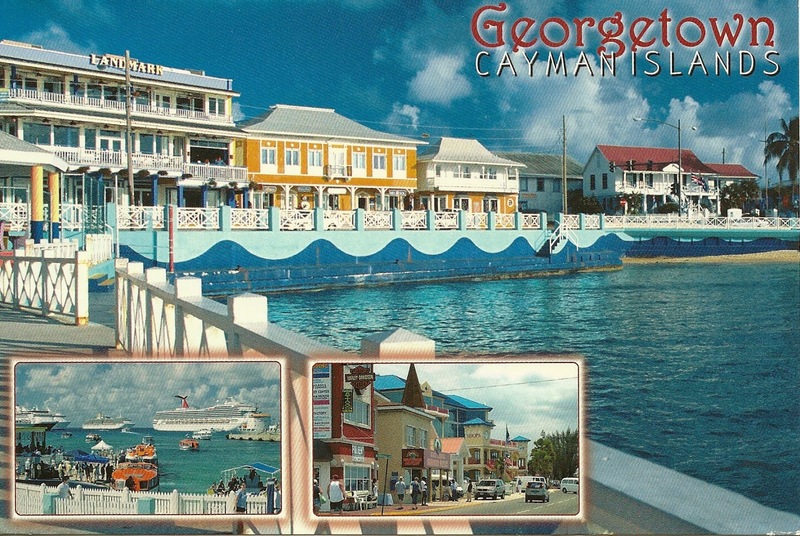 Caribbean-Cayman Islands-Grand Cayman-Georgetown There must be a few Georgetown's in the Caribbean I seem to have been to them all , named after the King of England. Georgetown is a pleasant enough stop . Quite a prosperous Island but it is a overseas territory of the United Kingdom and not independent. The Post office had a fine selection of stamps and all available for viewing . So full marks there. Interesting on the back of this card is a Recipe for Mango Cake! 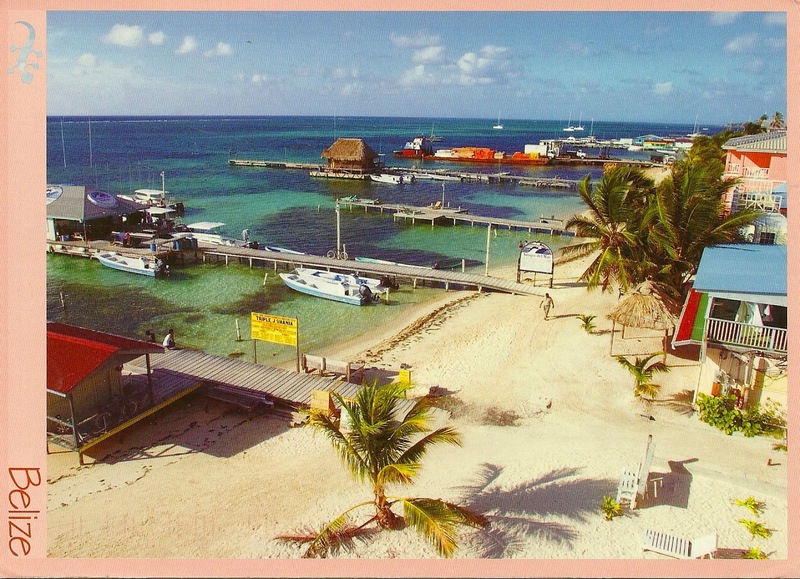 Central America-Cays of Belize-Ambergris Caye-San Pedro This is a very beautiful part of Belize. You need to get on the fast ferry to get here, but well worth it. Full of charm and laid back atmosphere. Certainly quite a few tourists about here. Very different than Belize City. 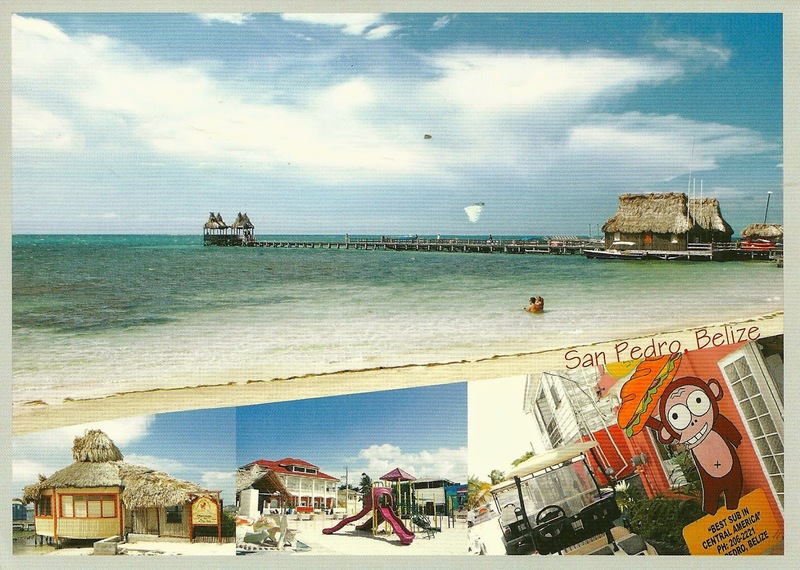 As you can see these are Cays of Belize Stamps. They were issued from 1984-1985. Here you can see a map of the Cays pronounced Keys. I brought these stamps with me from a Booklet that was issued. 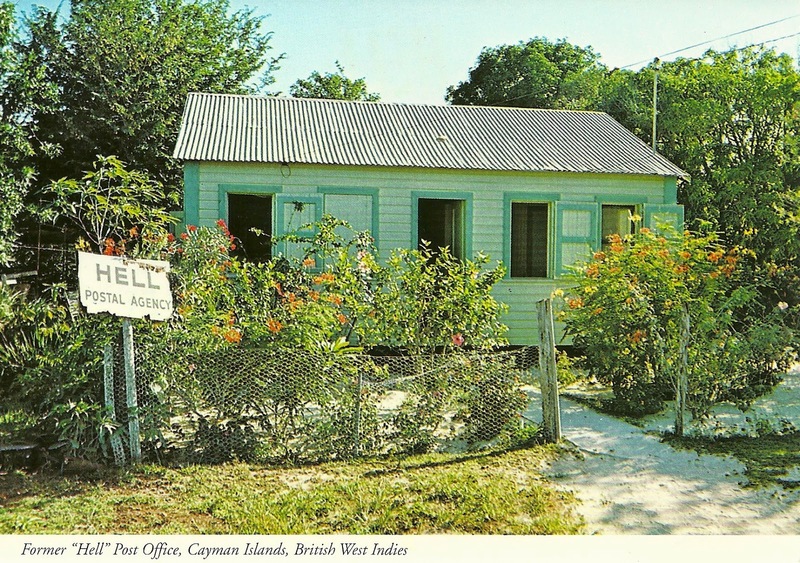 The Postmaster had never seen Cays of Belize Stamps as he had been working at the Post office for 10 years. They are still valid for postage. Central America-Belize-Ambergris Caye-San Pedro Here are more views of the Cays and give you a feel for the laid back feel of the Islands. These are the standard Definitive stamps in use throughout Belize. A busy post office . The Postmaster told me a lot of Americans stop by, as Belize is the only English speaking country in Central America. 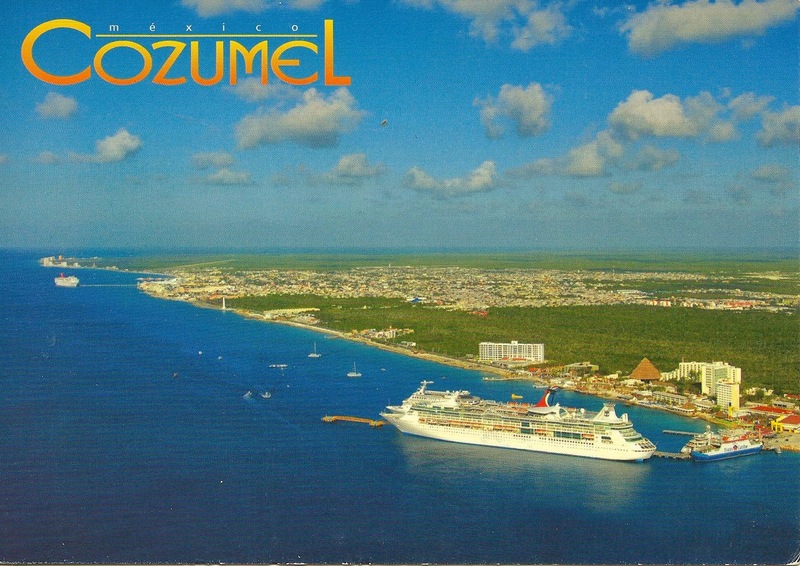 North America-Mexico-Cozumel Its cruise time agin. This time North and Central America. First stop is Cozumel. Only my second time to Mexico. Here you see a Carnival cruise liner in port. The same type of ship I was on. The last time it took over 5 months for my postcard to reach home. Well this time a lot better about 4 weeks. A definitive stamp , no selection available in the Post office. Central America-Belize-Belize City A country I had been wanting to visit for a long time. Reason being is that I have a specialised stamp collection of British Honduras its former name and Belize. The city itself is certainly nothing to write home about. But they do have a very interesting museum featuring a stamp collection of Belize. Visiting the Post office here something I had looked forward to. I had seen many images from the stamps . But was disappointed when I got here. The old Colonial Post office had burned down a few years ago. Now it was a very basic wooden building as so many are here. The Philatelic section is around the corner in the main post office. It was great to visit the staff there as I used to have an account . 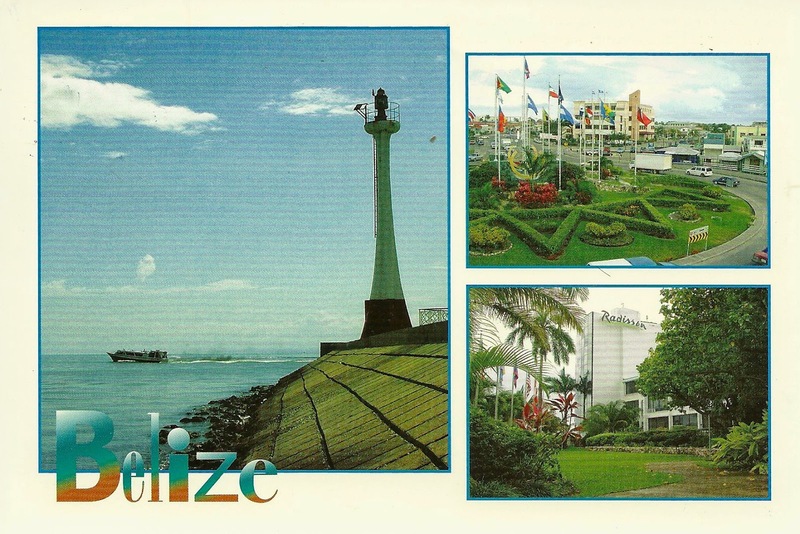 Unfortunately none of the staff had worked there long enough for me to discuss the big changes that Belize Philatelic bureau had gone through in the 1980s. They changed from the Crown Agents to a different company and before I knew it they were issuing more stamps then I could count. Unusually they were still mostly themed on Belize and not just the usual generic stamps featuring rock starts. The creme a la creme are the definitive issues with different overprints. Many were local and were not available to collectors. So some are very rare despite the low catalogue value. Here you see a localy overprinted stamp. I am not sure if this stamp even made it into catalogues yet.